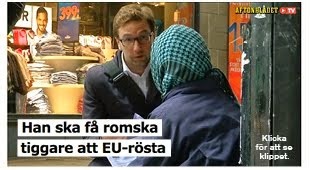 Jag skriver idag i Svenska Dagbladet om LO och pensioner. 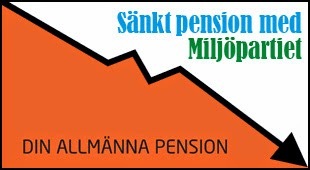 Trots högt prat om Mänskliga Rättigheter och etik, och inte minst kritik från LO-ägda AB Kultur och Socialdemorkaterna angående Carl Bildts engagemang i Lundin Oil så har LO:s pensionsfond investerat 73 miljoner kronor i samma bolag. Bäst vore om LO-medlemmarna får flytträtt över sina egna pengar. Det är bra att organisationen UN Watch finns. De granskar FN:s arbete för mänskliga rättigheter, som tyvärr alltför ofta handlar om att släta över eller nonchalera just MR-brott. UN Watch visar här hur FN:s råd för mänskliga rättigheter (UNHRC) i Geneve flaggar halv stång för att hedra Kim Jong Il. Det är klart att FN har vissa diplomatiska protokoll att följa. Men måste verkligen det organ som har till uppgift att försvara grundläggande mänskliga rättigheter flagga halv stång för en av världens i särklass mest brutala diktatorer? Den frågan ställer sig UN Watch, och den frågan borde också fler ställa sig. This article was published in the Swedish newspaper Upsala Nya Tidning (here in Swedish), Dec 16, 2011. On the 25th of February, three Philippine fishing boats anchored by the Jackson atoll, just west from the island of Palawan. This is something fishermen from the Philippines have done for centuries. However, on this very day, all of a sudden a ship approached, and on the radio came a very abrupt message: “This is warship 560 from the People’s republic of China. You are anchored on Chinese territory. Leave the area immediately”. The fishing boats were in such a hurry that one of them was forced to cut its anchor line. The Chinese vessel, a frigate armed with missiles, shot three rounds in the water right next to the Philippine fishing boats. The Jackson atoll is situated less than 100 nautical miles from the Philippine main land, and well within the exclusive economical zone of 200 nautical miles, as defined by the United Nations convention of the Law of the Sea. To China it is 600 nautical miles. This was not the first, nor the last, time the Chinese naval forces attacks boats from other states in the South China Sea. A few weeks after the above mentioned incident, a British research ship hired by the Philippines was chased away from Reed Bank by Chinese naval forces, after which China marked their presence by placing out large steel constructions around the area. During the spring of 2011 the authorities in Manila noted six Chinese military interventions close to the Philippine coast. The reason to this increased tension in the area is the increasingly aggressive actions taken by China in order to control the South China Sea and the atolls, reefs, and sand banks that constitute the Spratly islands. New deposits of oil and gas have been discovered in the area and it also has a large fish stock, thus the area is an important source of income for the states in the region. Six states fully or partly claim the Spratly islands. The claims are overlapping and the motives differ. The Philippines refer to the United Nations convention of the Law of the Sea, whereas Vietnam claim that jurisdiction of the island was given to them when the French left Indochina. Vietnam and Malaysia also invoke their claim on the basis of the length of the continental shelf. Most surprisingly, though, is China’s claim. Beijing claims that the entire South China Sea belongs to China, and invokes their proprietary right, which according to Beijing, stems from the Han dynasty in the 8th century. This can be compared with a situation where Russia would rightfully claim that the entire Baltic Sea would belong to Russian territory. China’s claim to the entire South China Sea can not be presumed to have legal support in neither international law, nor on any other legal basis. The South China Sea is an inland sea that connects the Indian Ocean with the Pacific Ocean. Practically everything going to China, Japan, Taiwan and South Korea, half of the world cargo traffic by sea, pass through here. Chinese claims on this entire inland sea can result in far-reaching consequences not only for the free navigational rights of the sea, but also for the balance of power in the international system. When visiting Tokyo during his first year as president, Barack Obama promised that the United States would “strengthen and maintain our leadership in this very important part of the world”. Foreign minister Hilary Clinton has also stated that the navigational freedom in the South China Sea is an American “national interest”. There is now a great risk that the United States’ influence in East Asia will decrease, partly due to the focus and obligations in other parts of the world during the last decade, partly because of the financial crisis, which has been a serious blow to the American economy. At the same time China has modernized their missile system, upgraded their submarine fleet and produced a large amount of fighter jets. Earlier this year, China’s first aircraft carrier sailed out on her maiden voyage. This Chinese rearmament has caused concerns in the geographical belt of democracies – Japan, South Korea, Taiwan, and the Philippines – which all have special security-political relations with the United States. The Philippines, for example, an island nation with nearly 100 million inhabitants, has one of the weakest armed forces in Asia. The Philippines is entirely dependent on a strong American military presence in the South China Sea in order not to be totally exposed to China. The regional cooperation in Asean is too weak to balance China. The Asean-members are at the same time keen on maintaining good relations with China and on solving disputes through diplomatic channels. However, this balancing act is hampered due to the Chinese rearmament. 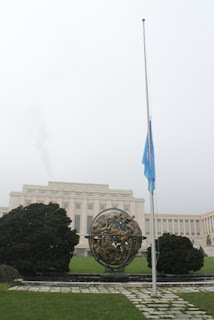 - The EU’s arms embargo on China must be maintained. As of today the embargo is not water proof, and in practice it only consist of one sentence in a conclusion by the European Council, adopted before the treaty of Maastricht entered into force. To renegotiate the embargo would however be too much of a risk, and should thus be retained in its present form. - Increase the effort and push for a multilateral solution regarding the situation in the South China Sea and the extraction of natural resources around the Spratly islands. The point of departure should be that the declaration of conduct, which the concerned states signed in 2002, ought to become a binding agreement. Taiwan, who is neither a member of the UN, nor Asean, controls the largest island among the Spratly islands (Itu Aba). It is therefore of outmost importance that Taiwan is involved in the process. - A continued American presence in East Asia is necessary for the balance of power in the region. This requires, in turn, that member states of the EU take greater responsibility in the European vicinity. In the longer term, it is difficult to motivate why the United States should play the leading part in Nato-led interventions in the European vicinity, as in Libya for example. Other Nato-members must be able to take that role. - China’s increasingly dominant position is causing great concern amongst the democracies in the region. An increased knowledge and understanding of this situation is necessary, and their concerns must be taken seriously. The commitment towards democracies that are concerned about development in Russia can serve as a guideline for the engagement in East Asia. While the Arab world has witnessed uprisings and revolutions, and Europe and the United States is facing a severe debt crisis, a far reaching shift of power is occurring in East Asia. In the globalized world of today, continents, fates, and flows are increasingly intertwined. When fishermen from the Philippines are attacked by the Chinese navy it is a single incident in a long chain of events, which ultimately will affect Europe and Sweden. It will require an active and committed policy in order to prevent a future scenario where we stand irresolute to far more difficult situations. 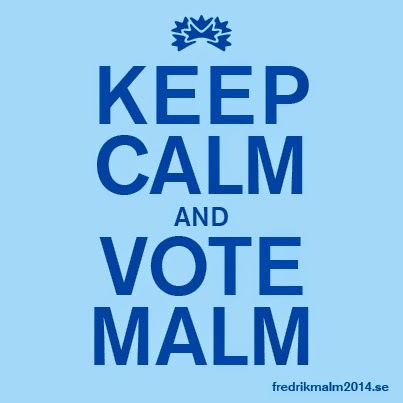 Jag skriver i UNT om det spända läget i Sydkinesiska sjön och Kinas upprustning. Kinas upprustning oroar och maktbalansen förändras i Asien med risken att USA:s roll försvagas, vilket oroar det bälte av demokratier som ligger öster om Kina, alltså Japan, Sydkorea, Taiwan och Filippinerna. Det kommer att krävas en multilateral lösning kring det överlappande anspråken på Sydkinesiska sjön, Spratlyöarna och utvinning av naturresurser. EU:s vapenembargo mot Kina måste upprätthållas. Andra länder, främst inom Nato, måste ta ett större ansvar för freds- och säkerhetsoperationer för att kunna avlasta USA. Jag kommer också här på bloggen att lägga upp en engelsk översättning av artikeln. Karta över Sydkinesiska sjön, hittad här. 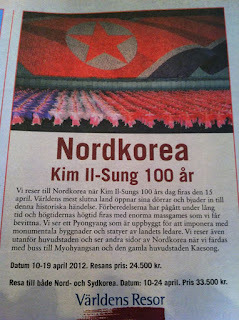 I dagens DN finns en annons för resa till Nordkorea. 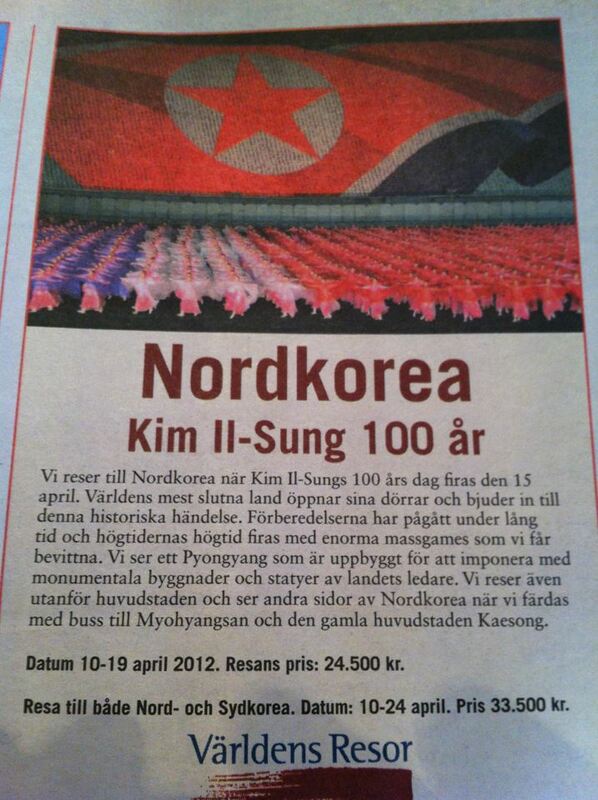 För 24 000 kr kan du åka till Pyongyang och vara med när landet firar Kim Il Sungs 100-årsdag. Att reseföretagens annonser ofta är tillrättalagda och vattnet och himlen är lite blåare än vanligt förtar inte det faktum att den här annonsen måste sätta något sorts rekord. "Högtidernas högtid firas med enorma massgames". Man tackar. Och vem har satt koreografin, eller ska vi säga koreagrafin? En av de äldsta och viktigaste assyriska platserna hotas till följd av dammprojektet Gap i Turkiet. Eftersom assyrierna/syrianerna knappt finns kvar i Turkiet till följd av folkmordet och efterföljande emigration så finns ett stort värde i att bevara det arkeologiska och historiska arvet. Läs mer om kampanjen för Ziyaret Tepe här.